Make the streusel topping: Mix together flour, 3/4 cup brown sugar, 1 teaspoon cinnamon, and 1 teaspoon salt. Cut in butter using a pastry cutter or rub in with your fingers until small to medium clumps form. Mix in 1/2 cup pecans. Refrigerate until ready to use. 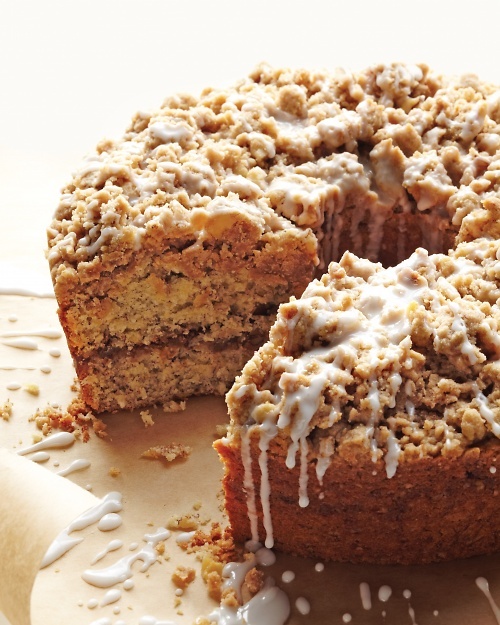 Make the streusel center: Mix together remaining 1/4 cup brown sugar, 1/4 teaspoon cinnamon, and 1 cup pecans. Preheat oven to 350 degrees. Make the cake: Butter a 9-inch tube pan with a removable bottom. Sift flour, baking powder, baking soda, and 1/2 teaspoon salt into a bowl. Beat butter and granulated sugar with a mixer on medium speed until pale and fluffy, about 2 minutes. Beat in eggs, 1 at a time, then vanilla. Beat in flour mixture in 3 additions, alternating with sour cream, beginning and ending with flour. Continue to beat until well combined. Bake until cake is golden brown and a toothpick inserted into the center comes out clean, about 55 minutes. Transfer pan to a wire rack, and let cool completely. Remove cake from pan, and transfer to parchment.